No monkey business here – kids love the jungle theme! And, whether it’s for a birthday party, baby shower, Christening or any other event, kids, and kids at heart, are sure to love these Jungle Critters Collection picture frames. 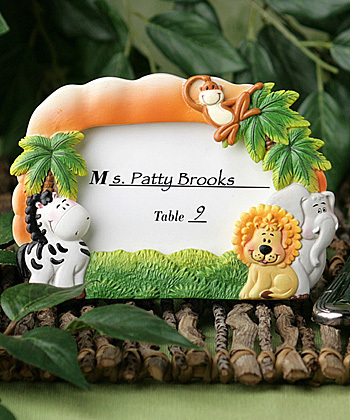 Sold only by Fashioncraft, each measures 4 ¼” x 3” and has a colorful hand painted poly resin outer frame featuring young jungle animals including a proud zebra, a smiling lion, a shy elephant and a playful monkey climbing a tree, all sitting together in the jungle grass below three palm trees. At the center of the frame is a window fit for a 1 7/8” x 3” photo or an event day place card. Guaranteed to get your guests feeling the jungle theme fever, each comes packaged in a white box.